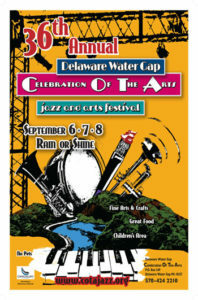 The Delaware Water Gap Celebration of the Arts is proud and pleased to present the poster for its 36th annual COTA Festival. 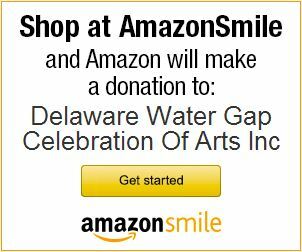 The poster was designed by local mixed-media artist Adiamarie Sessoms-Gibbs. 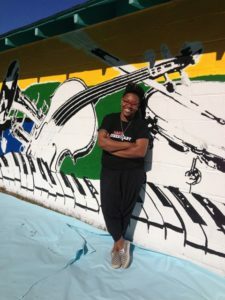 Besides creating the poster for this year’s jazz festival, Adiamarie has had her work presented in the Hughes Library, was an awards finalist at the Pocono Arts Council’s 2013 Member’s Exhibition, and is a regular fixture at the annual Newark Arts Council’s Strong Women Exhibit. The 36th Annual COTA Jazz Festival runs from Friday, September 6th through Sunday, September 8th, 2013.